Stir in the malt extract and dried yeast into the warm water and set aside to activate. Sift flour and salt together, finely chop the onion and mix in by hand being careful to distribute evenly. 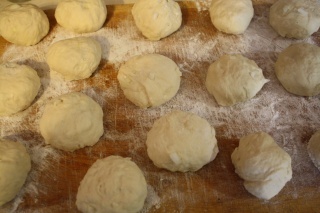 Add the yeast water mixture and stir into a rough dough. Knead on a floured surface until elastic and silky. Cover with a clean cloth and set aside to rise (an hour or so until doubled in bulk). Turn out onto a floured surface and knock back. Knead for 1 minute, then divide into 10 equal pieces. Shape into balls, cover with clear film and leave to rest for 5 minutes. Gently flatten each ball and make a hole though the center with your thumb. Enlarge the hole by turning your thumb around. 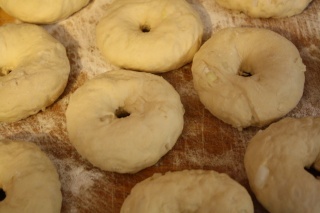 Place on a floured tray and leave to rise for 10-20 minutes. Place water and malt extract onto boil, then simmer. 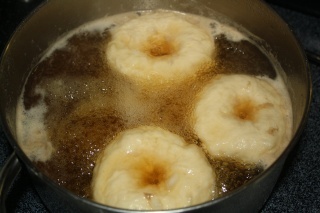 Place bagels in the simmering water 2 or 3 at a time and poach for 1 minute, turn over then poach for 30 seconds. remove and drain on a dishtowel. 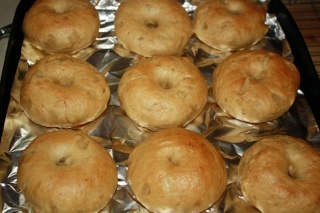 Place poached bagels on a baking sheet and bake for 20-25 minutes or until golden. Mmmm. Will have to try that when we are back in the land of the ovened. When I lived in London it was a great delight after an evening out to nip down to Brick Lane at 5AM when the first bagels were hot off the racks and munch them in the street, burning our fingers. Thank you Badger for the "how to"
Thank you B, this is just the push I needed to get me to have a try at them. I second the om nom nom. I never managed to master the bagel-fu when in the US but seems you've got it sussed. Lurves my bagels. I love picture recipes! Very inspiring! I might have to make some of those after the garden has frozen over and is done! Please when voting with your dollars be mindful and reduce buying plastic as much as possible, for it is trashing our planet and always consider this: If not Locally Produced, then Organic, If not Organic, then Family Farm. If not Family Farm, then Local Business. If not Local Business, then Fair Trade.